First things first – let’s discuss the proper spelling of the word tabbouleh. I thought the internet knew everything, but apparently it does not know which version is the correct spelling. Or maybe there is no correct spelling. Searches return the spelling I chose, but also with one less b (tabouleh) and with an i (tabouli), amongst others. The spelling I chose seems to be searched the most, but how do you choose which spelling to search? The world may never know. 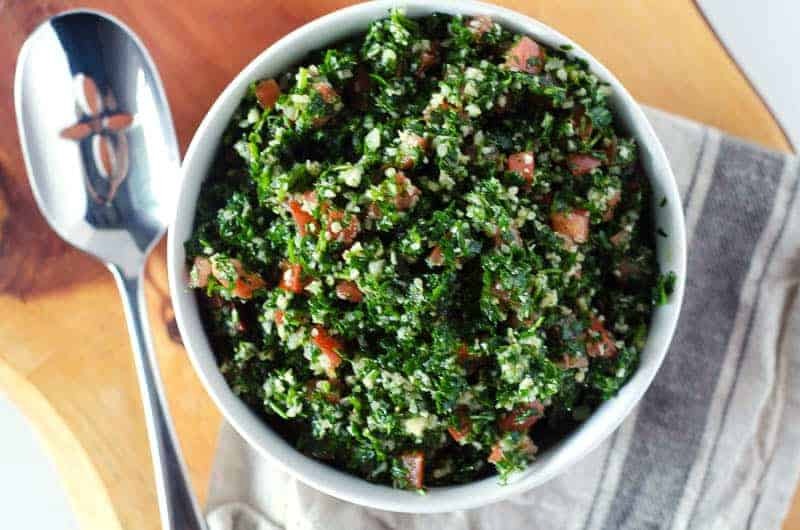 Now, let’s talk about how tabbouleh/tabouleh/tabouli is really just a bowl of parsley. Up until this point in your life, you probably always thought of parsley as an herb and a garnish (of which it is both) but not actually the base for a salad. Don’t worry, I did too. Then the other day we were in a hurry, and wanted to try and find something healthy to take home, and we stopped at a Lebanese restaurant. 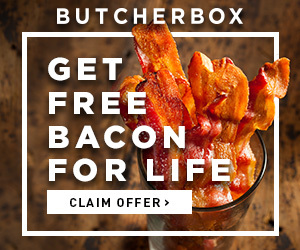 They let you pick your meat kabobs, and then choose 2 or 3 sides from their case to go along with it. We got some grilled veggies and a tabbouleh salad. The whole time I was eating it, all I could think about was how I was going to make it again at home. 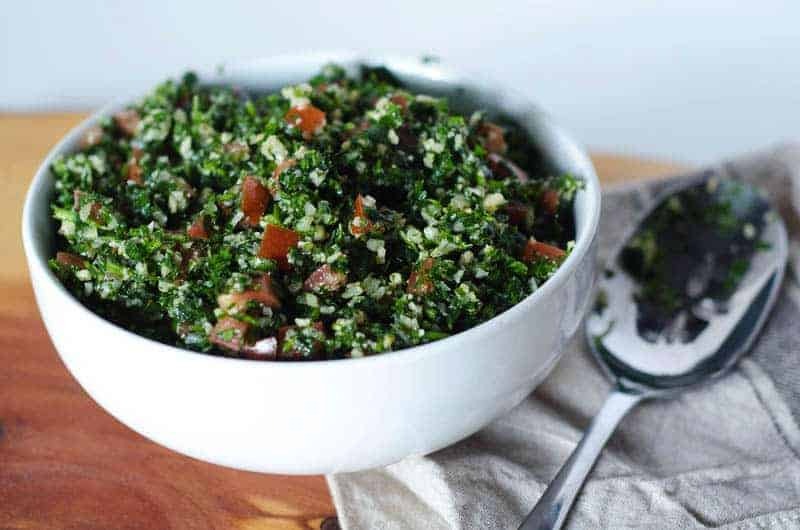 Traditional tabbouleh salad uses bulgur. Seeing as how I have a mostly paleo pantry, I don’t have things like bulgur on hand. But you know what I do have? Cauliflower rice. (Or as this ridiculous article likes to say, “cauliflower crumbles.”) And everything outside of that in a tabbouleh salad is completely paleo. Game on. I made mine quite lemony, as I like the tartness of it. If you’re not a fan of lemon taking center stage, you may want to add the lemon juice a bit at a time until it’s to your liking. 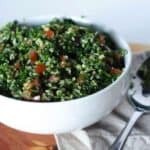 You can certainly eat this tabbouleh salad by itself, but it pairs great with meat or fish as well. I baked some salmon and topped it with this salad before serving, and it was the perfect pairing! It didn’t last long enough in the fridge for me to find out, as Brandan ate the rest of it, but I imagine it would be delicious with chicken as well. A grain-free version of the traditional tabbouleh salad. In a food processor, combine the parsley and mint leaves and pulse until finely chopped. In a large bowl, combine the cooked cauliflower rice, diced tomatoes, and parsley/mint mixture and stir. In a smaller bowl, whisk the lemon juice, olive oil, salt, and pepper. Pour the dressing mixture over the salad and toss well to combine. This salad is delicious eaten immediately after making, but if you give it a day or so in the fridge, the flavors blend a bit more and it is extra tasty! Hi Walid, thanks so much for your comment! While some people do include onion in their tabbouleh, I prefer not to. I use the food processor to speed up the process – however you could certainly chop it by hand if you would like to!